Winslow Arizona features a selection of images Stephen Shore presented in contemporary artist Doug Aitken’s project “Station to Station.” For the project, which Aitken calls a “nomadic happening,” he rented a train, which departed from New York and traveled to nine cities, including Minneapolis, through the southwest, and finally arriving San Francisco in a three-week journey. He invited artists, writers, filmmakers, and performers to participate, and staged a “happening,” which involved exhibitions and performances, at each stop. 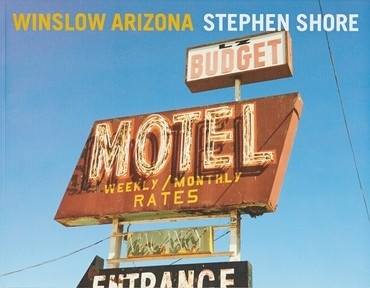 The images in Winslow Arizona, which Stephen Shore shot in a day while revisiting Winslow, Arizona, where he made his seminal work American Surfaces, are presented unedited, in the order that he shot them, making it an improvisational work.